A total of 14 John Deere machines will be on display for the first time at the Wirtgen Group booth. John Deere will be exhibiting a selection of its construction equipment – including motor graders that will be sold via the Wirtgen Group's German sales and service companies and via the French sales and service company Wirtgen France SAS – at bauma from April 8-14, 2019. A total of 14 John Deere machines will be on display for the first time at the Wirtgen Group booth. John Deere acquired the Wirtgen Group in December 2017. "Our strong relationship with the Wirtgen Group and their experience with bauma is allowing us to introduce John Deere construction equipment to a broader set of global customers," said David Thorne, senior vice president, sales & marketing, Worldwide Construction & Forestry. "We believe they will be impressed with the quality and innovation we build into each one of our machines. These customers will also benefit from the size and scale of our product lineup inclusive of the very successful motor grader line we are now bringing into select European markets." Driven by increased interest in John Deere earthmoving equipment following the Wirtgen Group acquisition and the heavy use of motor graders in road building, the 622GP and 672GP will soon be sold in Germany and France through Wirtgen Group subsidiaries. The 622GP will be shown at bauma. Both the 622GP and 672GP models feature six-wheel drive and fuel-efficient Final Tier 4 John Deere diesel engines (6.8L and 9.0L), boasting 227 (169kW) and 255 (190kW) horsepower, respectively. Thanks to six-wheel drive and automatic differential lock, the machines can power through the toughest cuts and gives operators increased traction in poor ground conditions or when working on ditches or side hills. The 622GP with 12-ft. (3.66-m) moldboard operates at a weight of 42,060 lbs. (19,078 kg), while the 672GP with 14-ft. (4.27-m) moldboard weighs in at 44,040 lbs. (19,976 kg). These Grade Pro (GP) models include comfortable dual joystick controls with lever steer and standard steering wheel; automatic return-to-straight; high-resolution reverse camera; rear mounted ripper/scarifier; front dozer blade; 16 light LED package; and Automation Suite – that helps operators improve daily production by reducing the number of controls needed to perform common tasks, including auto-articulation, blade flip and operator-selectable machine presets. John Deere motor graders include an "open-architecture" design, letting customers employ any of their favorite brand of grade-control systems. All GP models also come standard equipped with automated cross-slope. Cross-slope simplifies holding a consistent slope by allowing operators to run a single control while the machine automatically adjusts the opposite side of the blade. Joining the 622GP on display at the show is the 672GP SmartGrade motor grader. The SmartGrade model is currently only sold in the United States and Canada. Unlike the 672GP that will be sold in Germany and France, it features an industry-first and John Deere exclusive fully integrated, mastless 3D grade control system. This design eliminates the external masts and cables required on aftermarket systems. The mastless design enables the blade to be operated in any position, allowing a virtually unlimited range of leveling options and hydraulic functions. The first public showing of the E210 LC and E360 LC Series-II excavators will also occur at bauma Munich. These two models are part of John Deere's 10-excavator line manufactured at its facility in Tianjin, China and are sold in China, Russia, and parts of Southeast Asia. Series-II enhancements over previous models include updated cabs with premium air seat and an intuitive 17.8 centimeters touchscreen monitor with multi-language interface. The machines also boast new engines, the all-new John Deere intelligent hydraulic system that provides exceptional smoothness and controllability plus increases digging forces by 12 percent, and improved durability and serviceability features. Productivity is also enhanced by a new range of buckets using ultra-high-grade steel for increased wear life and a new profile that reduces penetration resistance by five percent. The E210 LC has an operating weight of 22,200 kg with a maximum digging depth of 6,700 mm. The larger E360 LC's operating weight is 37,800 kg and its maximum digging depth is 7,660 mm. Both feature a sealed switch module for activating machine functions that virtually never wears out, internally welded boom bulkheads for maximum strength, heavy-duty cooling systems, and wet-sleeve engine cylinder liners for long service life. The recently introduced 624L wheel loader has a bucket capacity of 2.3 to 4.0 cu. m., and will be shown at bauma with the standard Z-bar boom. High-Lift and High-Lift Plus Z-bar booms are also available to match the lift height needs of various applications. For customers needing maximum visibility to their work tool, a tool carrier linkage is also available. Electrohydraulic controls enable many convenient features, such as automatic bucket vibration to fine-meter material out of the bucket, soft hydraulic stops for improved comfort, and many customizable presets. Also on display will be John Deere's largest wheel loader, the 944K. 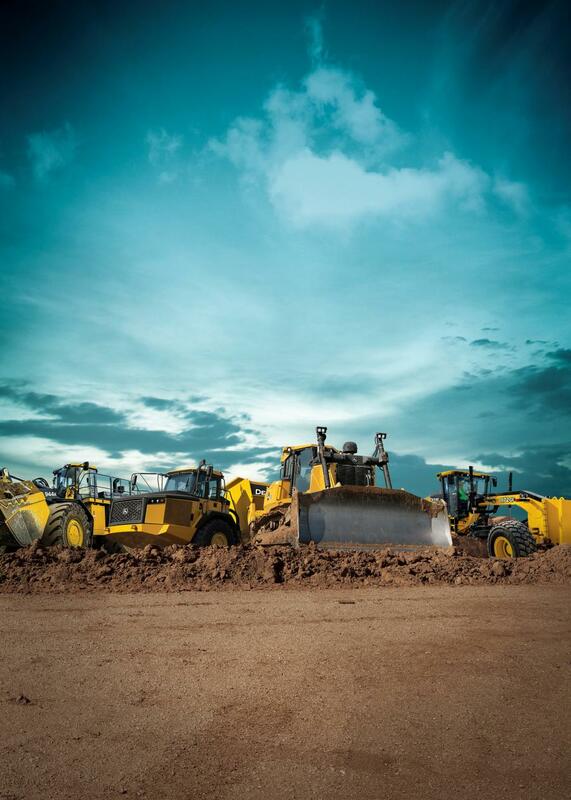 The 944K is the only wheel loader in its size class to feature a hybrid-electric drivetrain. Each wheel features a highly reliable electric motor. The 944K's bucket capacity of 7.65 cubic meters is perfect for production-class applications, such as loading shot rock in a quarry. Several advanced construction equipment technologies will be showcased inside the John Deere Technology Center at bauma, including a presentation of the advantages John Deere SmartGrade fully integrated grade control has over standard aftermarket grade control installations for both motor graders and crawler dozers. Attendees will also see how the unmanned aerial intelligence system available through John Deere dealers is used to capture survey-grade topographic data, monitor jobsite progress and calculate inventory of material stockpiles. This system can accomplish these tasks in just a fraction of the time required by conventional methods. A step-by-step view of John Deere Connected Support will demonstrate how John Deere is leveraging telematics to deliver higher levels of uptime and reduce costs for customers. Attendees will also be able to interact with JDLink Dashboard, John Deere‘s user interface for its telematics system, where a wide variety of machine information is gathered and organized to help customers better manage their equipment fleet. Finally, attendees will be able to try an excavator or motor grader simulator. These simulators are available to help teach machine operation before ever placing an operator in the seat of the cab. The John Deere display is located within the Wirtgen Group Booth FS. 1011. For more information about John Deere and Wirtgen at bauma, please visit www.wirtgen-group.com/bauma. For more information about John Deere, visit www.JohnDeere.com.